Contents: Vios green compressor, PARI LC+ reusable nebulizer and backup reusable nebulizer, Wing Tip tubing, Timestrip and instructions for use. Delivers fast treatments with targeted delivery to the lungs. 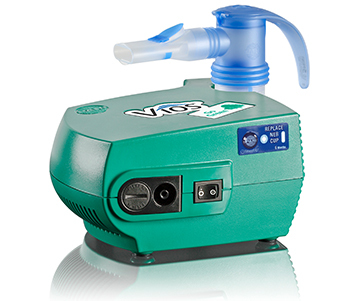 PARI Vios consists of two important components, a compressor and a PARI nebulizer delivering consistent particle size and fast treatments for targeted delivery to the lungs. PARI Vios is going green today for a better tomorrow! The new PARI Vios Green features an emerald green compressor, environmentally friendly packaging and instructions for use as part of our green initiative.